It now supports WooCommerce plugin. It now supports Easy Digital Downloads plugin. These two are among most popular WordPress eCommerce plugins.For eCommerce website or websites selling products ranking of product pages do matter.The higher the product pages rank the greater are chances of getting traffic from search engine. The greater the number of visitors the more are the chances of sale.Since Mobile eCommerce is growing at a fast rate it has become important to rank higher on mobile search.The pro version of the plugin helps your product pages rank higher in Google Search.It increases visibility of your product pages by telling Google that these pages are mobile compatible. .In case you are using different eCommerce plugins then you can raise request for its support.It will be added in main version of plugin and will be available to you in the same cost as that of pro plugin. The plugin is now merged with the Sitemap plugin. This helps you install only a single sitemap plugin which will take care of all your website needs. The Sitemap plugin supports XML Sitemap, Image Sitemap, Video Sitemap and HTML Sitemap along with AMP sitemap or mobile sitemap. Sitemaps have become important part of Search Engine Optimization.With increase of Mobile device usage for web browsing Mobile has become focus point for every business owner.Google Mobile Search volume or Facebook mobile user volume is increasing every year. 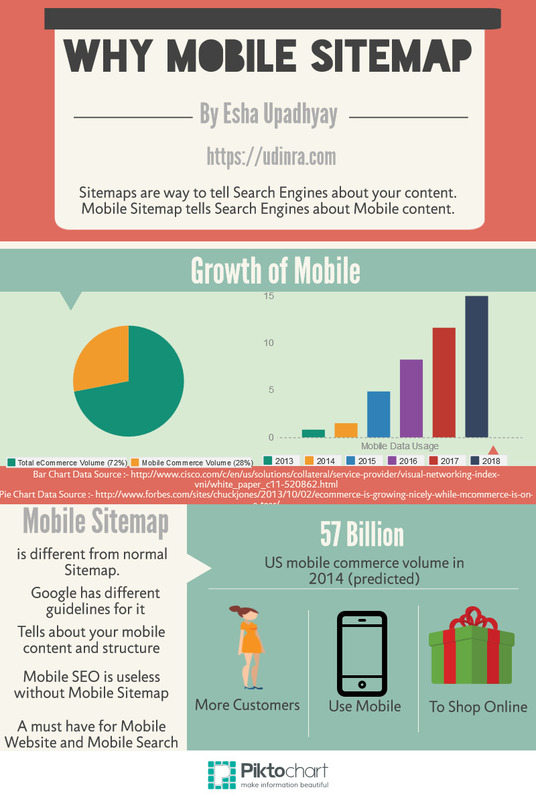 Below infographic just explains the importance of Mobile and Mobile sitemap visually. Google has laid separate SEO guidelines just for Mobile Websites or mobile compatible websites.It has come up with separate mobile sitemap protocol as well.Mobile Sitemap allows website owners to tell Google about their mobile compatible content. READ Sitemap Are you using them correctly on your site? So as a website owner it is your responsibility to tell Search Engines about Mobile friendly website of yours.This will help Google rank your website appropriately in Mobile searches.You can create the sitemap and submit it in Google Webmasters,Bing Webmasters and Yandex Webmasters.Even if you have submitted Normal XML sitemap you can submit Mobile Sitemap.There is no harm in it. There are not many mobile sitemap plugins available in WordPress.I create the plugin for use on this website.Later on I shared it with WordPress community.The basic version of the plugin is available for free download from WordPress.org (here is the link). The free version is sufficient for most of the websites.But for websites selling their products using popular eCommerce WordPress plugins like WooCommerce and Easy Digital Downloads I have developed pro version of the plugin.The pro version of the plugin helps product pages of sites rank higher in Google Mobile Search.This in turn will increase sales of your products. Pings Google,Bing and Ask.com — You can control which search engine should be pinged.It is good to ping all the search engines.So selecting the options to ping these search engines is recommended.It is only mobile sitemap plugin which provides this feature.Pinging search engine informs about new content and is good for SEO. Creates Mobile Sitemap automatically — It creates mobile sitemap automatically if you publish either page or post.You can turn this feature on or off.This great control is another feature which distinguishes this plugin with others in market. Creates gziped version of the mobile sitemap.It is good to gzip (compress) your sitemap if it is big.If gzip version of sitemap generation is enabled then this version is pinged to search engines.This feature is not present in other sitemap plugins. Fast and Simple — The plugin is optimized for performance.It is low on resource.The queries used are optimized for better performance.So you should not worry about it’s impact on page load time or server load. Follow the same steps as other plugins. Extract the zip file in wp-content –> plugins folder. Activate it from WordPress Dashboard. Configure the plugin and generate sitemap.If you face any issues then follow below steps. Create a sitemap-mobile.xml file in your WordPress root directory.Make the file writable (644) file permissions. If you want to create gziped version of your sitemap then create sitemap-image.xml.gz file in your WordPress root directory.Make the file writable (644) file permissions. Should I use Mobile sitemap? Yes.Mobile Sitemap tells Search Engines that you have content which is mobile compatible.This increases your ranking in mobile search ranking. Should I ping Google and Bing? Yes you should ping Google and Ping.It is very important to make them aware of your fresh contents.So I would suggest you to check all the three check boxes (in plugin configuration section there are check boxes for pinging Google,Bing and Ask.com). The plugin will take care of rest. How to create blank sitemap-mobile.xml file? Log into your Cpanel account and go to File Manager option of Cpanel.Browse to your WordPress root directory.Click on create new file and name the file as sitemap-mobile.xml.Make the file writable.You can make it writable by changing permission of the file.The permissions to use depends from server to server you can use 600 and if it does not work then use 660 (but never use 666). Why plugin not adding Sitemap to Google Webmasters? Some users of plugin have asked me this question.So I am including it here for everyone’s reference.There is confusion about pinging search engines option of the plugin.The plugin pings search engine about your website content and any update in the content.Say you added new post then Search Engines will be informed that your website is updated with new content.Search Engines like Google will crawl your website for new content. Pinging Search Engines will increase your crawl rate and inclusion of new content in search engines faster.But adding sitemaps in Google Webmasters is entirely different.The sitemap file should be manually added in Google Webmaster for the first time.Plugins does not add sitemap file in Google Webmasters or for that matter any other Webmaster tool. This plugin will be in active development and maintenance.Features can be added based on your comments and suggestions. Do feel free to share your thoughts? If your mobile and desktop URL are same (assuming you are using responsive theme) it is not required. Also support for amp posts are in progress. Current version does not support it. I appreciate your brilliant work. Why do I need mobile sitemap when my url for mobile and desktop is same? Does Udinra Mobile Sitemap use my /amp/ posts? I succesfully installedit and it’s running correctly in several sites.Then I installed it my largest site (>30.000 pages) and it doesn’t work. Can you help me? Is it something else I can do? I have a WordPress site (http dot //santabarbarawinetours dot org) for which I’ve built a mobile version which is also built on WordPress (http dot //m dot santabarbarawinetours dot org). The content on the two site is very different. In this case, is it best to use your Mobile Sitemap plugin on the main site, mobile site or both?